EF Education First announced today the results of a global study revealing that English language competencies of country workforces are worse than their corresponding populations as a whole; a worrisome trend for global competitiveness. The results of the EF English Proficiency Index for companies (EF EPIc), a global study of almost 115,000 employees and 1.7 million adults carried out by EF Education First (EF), the world’s largest privately owned education company, have been released today. The survey reveals that the national workforces of a staggering two-thirds of the 24 countries tested, have weaker English abilities than the adult populations as a whole, sometimes by significant margins. The countries with the widest gaps were Denmark, the Czech Republic, Japan, and Russia. Why are employees’ English skills found to be deficient compared to the general adult population as a whole? One possible reason is that adults in full-time employment are often too busy to organize training outside work hours. Another explanation of greater concern is that perhaps individuals are becoming complacent in their current positions and do not feel the need to build up their skills. It is therefore likely that, in the absence of corporate language training programs, they will not seek to improve their English of their own accord. Commenting on the findings, Andy Bailey, CMO, EF Corporate Language Learning Solutions said: "The findings of the EF EPIc will undoubtedly be of significant concern to business leaders around the world because employee proficiency in English, which after all is the lingua franca of cross-border business, is essential to achieving international commercial success”. He continued, “With a challenging business environment in almost every corner of the world now, and tougher and tougher competition for overseas market share, it’s absolutely essential for business leaders to ensure their workforce has the language and communication skills to stay ahead”. The EF EPIc also highlights significant differences of English proficiency between seniority levels within business. In many countries, the report shows a trend that middle-management speak better English than both their senior management superiors and their subordinates. “Discrepancies in English competence at different levels of seniority can have a catastrophic effect, particularly in international knowledge-based organizations and industries,” Bailey continued. “Without good English communication skills it becomes nearly impossible for efficient knowledge-sharing and transfer, either across or up and down an organization, and that has a direct impact on competitiveness and value”. The index also found that English proficiencies vary considerably between industries; the Travel & Tourism and Consulting industries coming out on top, with Retail and the Public sector languishing at the bottom of the scale. However, even though the Travel & Tourism industry is internationally focused at its core, the average English competence was only “Intermediate”. And while the need for English skills within the Public Sector may not be immediately obvious, increased competition with the Private Sector, the drive for efficiencies and best practice sharing both within and across borders, along with the political desire for increased economic competitiveness, all make English competence a significant requirement. Bailey concluded, “The EF EPIc has clearly shown that English proficiency levels in the workplace are often simply not good enough. Business leaders around the world must do all they can to reverse this trend because, if left unchecked, it will have grave implications for their business’ international efficiency and overall competitiveness on the world stage”. The EF English Proficiency Index for Companies (EF EPIc) is an evaluation of global workforce English skills sponsored by EF Corporate Language Learning Solutions (http://www.ef.com/corporate) , the trusted leader in language training for international businesses, organizations, governments, and executives. EF EPIc measures the English proficiency levels in 18 industries and 24 countries, in companies with an annual turnover ranging from under 1 million to over 100 billion US dollars. 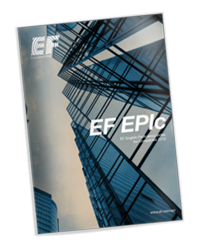 The EF EPIc is a companion to the EF EPI report, which evaluates adult English proficiency levels around the world based on a separate set of test results from 1.7 million people over the same three year period. Together, these two reports provide a multi-faceted perspective of English ability around the world.